Captains greet each other, Denesh Ramdin (right and Hashim Amla. of upsetting the world’s best team, South Africa, as the first test begins here at SuperSport Park in Centurion today. Denesh Ramdin’s outfit, languishing at number eight in the test rankings, is taking on the number one ranked South Africans in a David and Goliath clash, the first in a three-test series. The West Indies, whose last win against South Africa was in the opening test in 2007/08 series, are playing the home side at a venue where they have won 14 of 19 tests. “This would be a very challenging series for us”, conceded Ramdin. “South Africa has been doing something very good to be at the top of the rankings. It is important that we play consistent cricket throughout”. The lowly ranked Caribbean side, above Bangladesh and Zimbabwe, in the ICC test rankings, is without opening batsman Chris Gayle, whose back injury returned when playing Twenty20 cricket in South Africa last month, and Darren Bravo, who opted out of the tour for personal reasons. Veteran Shivnarine Chanderpaul and Marlon Samuels, who was top run scorer on the last tour of South Africa and who hit a double-century in the warm-up game, are expected to be key to the Windies scoring. Chanderpaul going through his paces during training. younger guys go along “. South Africa are wary of a West Indian bowling lineup that includes left-arm fast bowler Sheldon Cottrell, Kemar Roach, Shannon Gabriel and Jason Holder and coached by former pacer Curtly Ambrose. Rookie pacer Cottrell is being tipped to be a surprise element for West Indies after recent spells in the WICB Professional Cricket League and an explosive five-wicket burst in last week’s three-day tour match. The surface at Centurion is known to offer bounce and carry despite a significant amount of green grass being stripped from the pitch on Monday. Atmospheric conditions will also favour fast bowlers and rain is forecast for every day of the match, except Saturday. Still, both teams are considering including a spinner in their line-up. “It’s the biggest decision management will have to make,” said AB de Villiers. “Centurion normally doesn’t turn that much which makes you feel that you’ve maybe go with that extra seamer but with the team we are playing against, it might not be a bad idea to play a spinner”. The West Indies clash against South Africa is their first international match since its tour of India was abandoned in October because of a pay dispute. Despite their high ranking status the South Africans have not written off their Caribbean opponents and are concern about players who they are unfamiliar with. “Ramdin has rallied them quite nicely after their recent troubles so they could be quite difficult to beat,” fast bowler Dale Steyn said. Hashim Amla, who is captain in a home series for the first time since replacing iconic Graeme Smith in March, says Ramdin’s men must not be taken lightly. 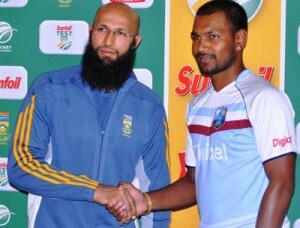 “The West indies team are a good team,” said Amla, who attended a joint news conference with Ramdin. “They have a lot of young faces and inexperienced guys but many teams have come here before in similar situation and provided a very formidable challenge. So we will have to be on top of our games”. The first Test Match will be played at SuperSport Park in Centurion, starting Wednesday. First ball is 10:30 am daily (4:30 am Eastern Caribbean Time/3:30 am Jamaica Time).